Lebanon’s foremost Druze leader Walid Jumblatt restated today his call on residents of the Syrian Druze stronghold of Jabal al-Arab, also known as Jabal al-Druze, to join the Syrian uprising against President Bashar al-Assad. His appeal came in a cable to Syrian activist Muntaha al-Atrash on the occasion of the 30th anniversary of the death of her father, Sultan Pasha al-Atrash. March seems an ill-starred month for Druze leaders. Sultan Pasha al-Atrash was 91 when he passed away on March 26, 1982. Walid’s father, Kamal Jumblatt, was shot dead in his car on March 16, 1977, as it approached a Syrian military checkpoint in Lebanon’s Chouf district. 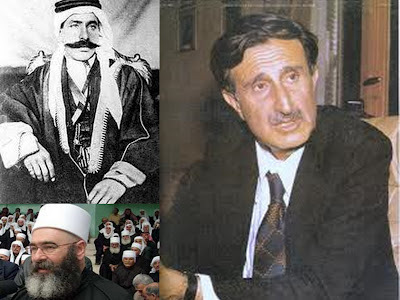 And the highest spiritual leader of Syria’s 700,000-strong Druze community, Sheikh al-‘Aql Ahmad Salman al-Hajri, was killed on Sunday, March 25, in a car accident which Syrian activists say was staged by the regime. Also today, Yacoub Kara, a Druze legislator in Israel’s Knesset, is quoted as saying Hajri’s death was staged in an “accident” that is archetypal for eliminating regime opponents in Syria.